African ironwood | Infonet Biovision Home. 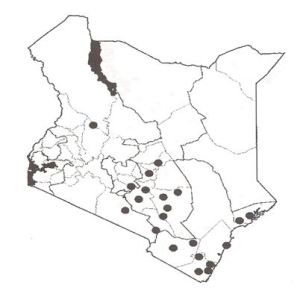 Boni (Samachi); Digo (Mpingo); Duruma (Maringo); Swahili (kikwaju, mpingo, poyi); Giriama (Muhingo); Kamba (Muvingo);Meru (Mwengo);Taita (Myingo). It is a small tree of semi arid Africa and India. It is native to Angola, Botswana, Eritrea, Ethiopia, India, Mozambique, Nigeria, Senegal, South Africa, Sudan, Tanzania, Uganda, Zambia and Zimbabwe. In Kenya, it is common in Meru National Park and Kitui, Kilifi, Machakos, Taita taveta districts. Also occurs in Tsavo East and around Makueni. Dalbergia melanoxylon provides one of the valuable timbers known. It has hard, durable, termite-resistant, purple-black heartwood enclosed in a thin pale yellow outer layer of sapwood. Wood is dense and polishes well. D. melanoxylon does well in the altitude range of between 0 and 1200 m. above sea level; mean annual temperatures of between 18-35 degrees annual rainfalls of between 700 and 200 mm. Soils vary from loamy sands to black cotton soils. 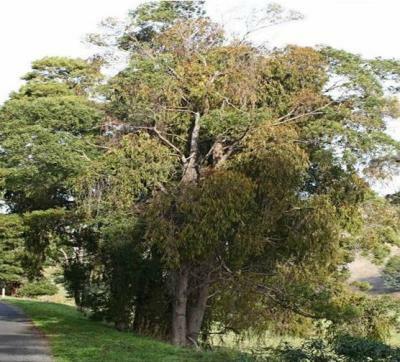 The tree prefers areas with a higher water table and is often found in deciduous woodland or bush land , wooded grassland, in rocky sites or on black-cotton soils. It is found in agro-ecological zones II - VI. May be propagated using seedlings, wildings or cuttings. It also produces root suckers which can also be used for propagation.It is extremely slow growing; they attain timber size in about 70 - 100 years. Coppising can be used management and side-prunning gives a clear bole. Occurs in woodlot, mixed and enrichment systems, field trials are currently exploring suitable spacing for D. melanoxylon plantations. An initial spacing of 2 x 2 m results in good branching characteristics, while later thinning improves growth. Stem form is improved by raising the trees under medium shade provided by Pinus caribaea. Thorough weeding is important at the initial phase of establishment. After 5-7 years, trees planted early in the rainy season on thoroughly weeded plots averaged about 30% taller than trees planted at the same time but only lightly weeded. Trees planted in the middle of the rainy season and thoroughly weeded were about 45% taller than those planted at the beginning of the rains and lightly weeded. Intensive weeding is crucial until the tree's root-collar diameter measures about 5 cm. Alternatively, the area around the tree should be slashed until its root-collar diameter measures 8-10 cm. Seed storage behaviour is orthodox; viability can be maintained for several years in hermetic storage at 3 deg. C with 9 - 12% mc. There are about 42 000 seeds/kg. Fodder: The pods and leaves can be used as animal fodder. Apiculture: Like other members of the genus Dalbergia, its honey is dark amber and strong flavoured. Fuel: Provides high quality fuel; heat generation is so high that fires of D. melanoxylon have been reported to melt cooking utensils. Timber: Produces high quality timber. It is slightly oily, exceptionally hard and very heavy, brittle and somewhat fissile. The heartwood is extremely durable and resistant to all forms of biological deterioration and insect attacks. Medicine: The roots are used in traditional medicines to treat abdominal pain, diarrhoea and syphilis. The wood smoke is inhaled to treat headaches and bronchitis. Soil fertility improvement: It improves soil fertility through nitrogen fixation. Shade or shelter: The usually evergreen behaviour potentially makes B. aegyptiaca an attractive element to introduce into shelter belts, although because of its slow growth, it is not suitable as a principal species. Heart rot has been observed on some logs, apparently associated with fungal infection following fire damage. Small game may feed on young shoots and leaves. Beentje HJ. 1994. Kenya trees, shrubs and lianas. National Museums of Kenya. Bekele-Tesemma A, Birnie A, Tengnas B. 1993. Useful trees and shrubs for Ethiopia. Regional Soil Conservation Unit (RSCU), Swedish International Development Authority (SIDA). Birnie A. 1997. What tree is that? A beginner's guide to 40 trees in Kenya. Jacaranda designs Ltd.